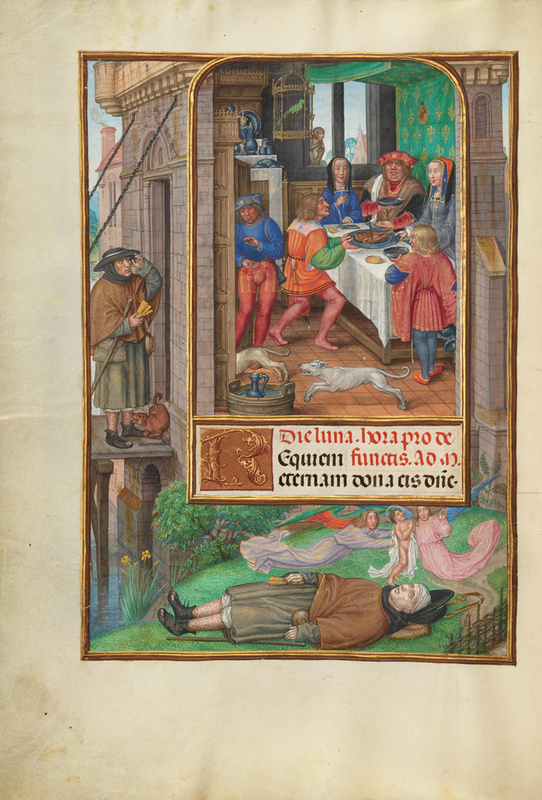 A series of wonderfully vivid images tells the Biblical parable of Lazarus and the rich man. Splendidly dressed in furs and jewels that indicate his great wealth, the rich man, called Dives, sits at a table crowded with dishes. His double chin and girth are clear signs of his over-indulgent habits. The artist cleverly constructed the miniature to show simultaneously the interior and the exterior of the house. Outside the frame, Lazarus approaches the house to beg for some scraps from the rich man's table. Dives refuses the humble request, while his dogs race to lick the sores on Lazarus's pathetic body. Below, Lazarus has died from hunger and exposure, but two angels greet his soul and enfold it in a white cloth. The facing image finishes the story.